Calling all small to mid-sized cities across the country: America’s largest free outdoor concert series is about to get even larger, and the spotlight is on you! 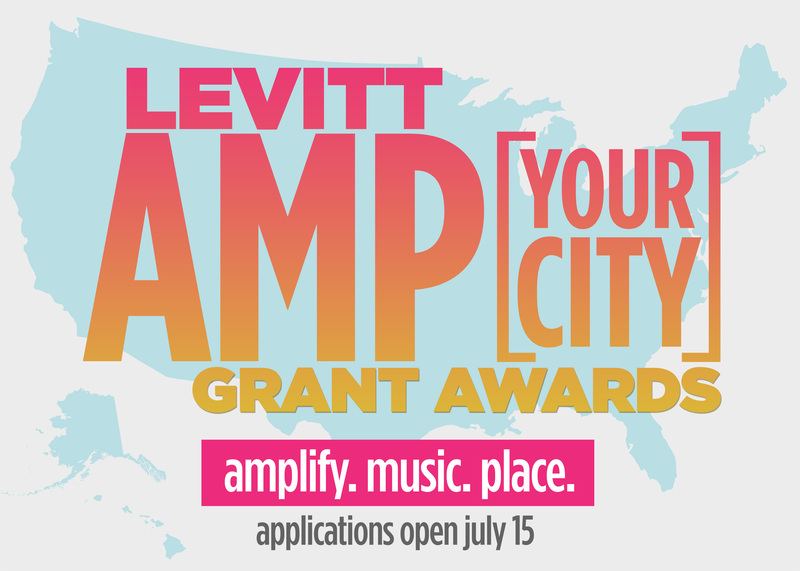 Starting in 2015, Levitt’s national program of 300 free concerts across the country will increase to 400, thanks to an exciting, new matching grant opportunity—the Levitt AMP [Your City] Grant Awards. In addition to 100 more free concerts, Levitt AMP will broaden the geographic impact of the Levitt program by focusing on small and mid-sized cities. And in another first, the public will get to decide which 20 cities make it to the finals round through an online voting process to take place next fall. So get ready to rally your colleagues, friends and family members to vote and bring the joy of free, live music to your city! 10 U.S.-based nonprofit organizations, or municipalities partnering with a nonprofit, serving cities with metro populations of up to 400,000 will receive up to $25K each in matching funds. With the award, grant recipients will present a new kind of Levitt season featuring at least 10, free outdoor concerts during 2015-16. (This is in contrast to the 50 free outdoor concerts of the signature Levitt program, which takes place in large cities.) The concerts, to be known as the Levitt AMP [Your City] Music Series, will feature a musically diverse lineup of professional artists that will dazzle audiences week after week. A proven track record presenting professional quality concerts or partnering with an individual or organization that has done so. The selection and characteristics of the public space where the free concerts are to be presented—preference will be given to those spaces that are easily accessible to a range of socio-economic groups. A programming philosophy that is inclusive, family-friendly and represents a wide range of music genres, in keeping with the national Levitt program. Grant applications are due October 15. Following an online voting process during November to select the top 20 proposals, the final 20 will be reviewed by Levitt Pavilions. 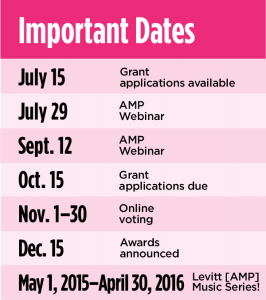 The 10 selected Levitt AMP [Your City] Grant Awards recipients will be announced December 15 for the 2015-16 calendar year. Help us spread the word about Levitt AMP and put your city on Levitt’s map! This entry was posted in Levitt AMP, Levitt in America, News, The Levitt Effect and tagged AMP grant awards on March 18, 2014 by Vanessa Silberman.